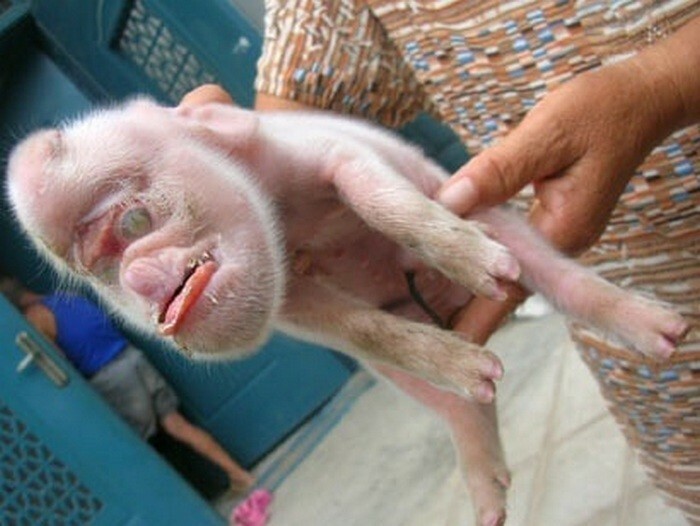 Inbreeding, unfortunately, is still being forced on animals by humans. It has significance in the field of animal research and in maintaining the existence of endangered species but it also poses a lot of risks and serious adverse effects. 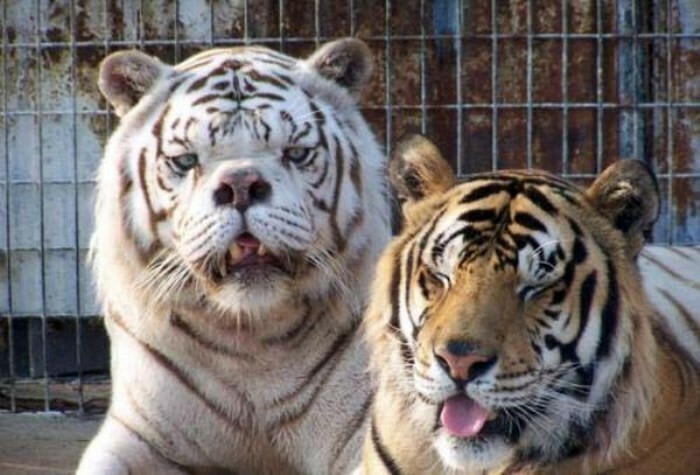 Kenny the Down Syndrome tiger in a United States zoo, for example, demonstrates the kind of risks and adversities inbreeding brings about. Learn more about the different drawbacks or adverse consequences of inbreeding in animals in the following list. 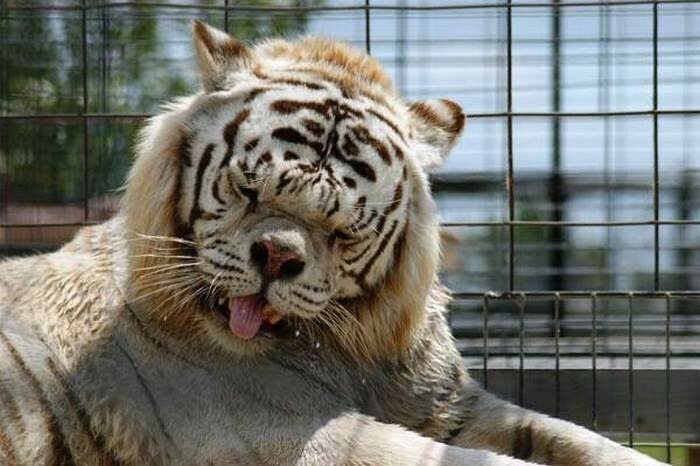 Kenny is a white tiger who has Down SYndrome. As shown in the photo above, his physical traits are noticeably different. He has a large snout, a more pronounced forehead, eyes that are significantly different from those of normal tigers, and other physical differences. Moreover, he behaves differently as he is believed to be mentally retarded. Inbreeding is believed to be the reason behind this abnormality. As zoos continue to selectively inbred white tigers to maintain the breed, negative effects are bound to happen. The limited gene pool is paving the way for a high rate of deformities, abnormalities, and health issues. Cats are said to have nine lives but if they are perpetually subjected to inbreeding for certain qualities like the pedigree cats used for contests, these nine lives may easily be depleted. Animal welfare experts have been issuing warnings about the development of fatal diseases and deformities among inbred cats. 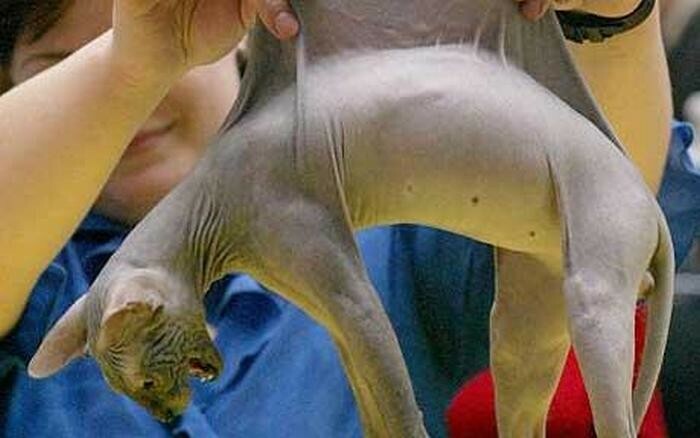 Inbreeding has produced hairless sphynx cats that could not survive the elements, cats with joint disorders, and cats with severe cartilage issues simply because breeders wanted to exploit a particular genetic trait that should have remained recessive. The Royal Society for the Prevention of Cruelty to Animals, People’s Dispensary for Sick Animals, and the Feline Advisory Bureau have been highlighting these concerns. There’s a need for pet owners, especially those who are fond of joining pedigree contests, to be mindful of the welfare of the animals they raise. 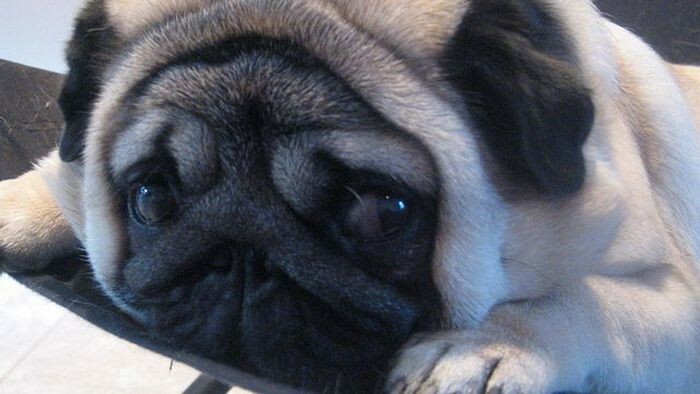 Pugs are undeniably adorable but the face they have now are not what they used to have in the past. Extremely flat pug faces have made it difficult for the animal to breathe. The unnatural flatness of their faces also makes it easy for them to damage their eyes after bumping into things. 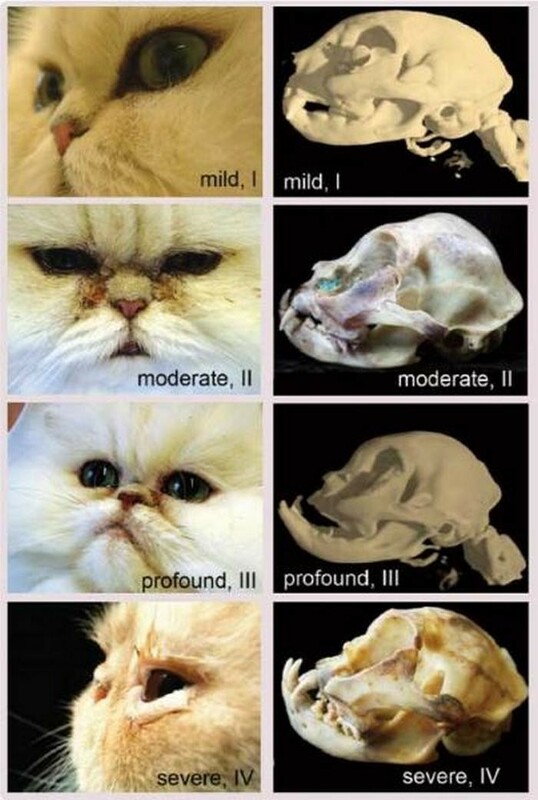 Similar to the case of pugs, excessive inbreeding has led to many Persian cats becoming too flat-faced and short-nosed. These cause the animal to have breathing difficulties, large protruding eyes that are prone to injuries, persistent ocular discharge, dental diseases, unwanted facial folds that invite skin infections, and brachycephalic airway syndrome. These are all detrimental to the cats’ health and should be properly addressed. What snake would ever need bulges around its body? None, of course. 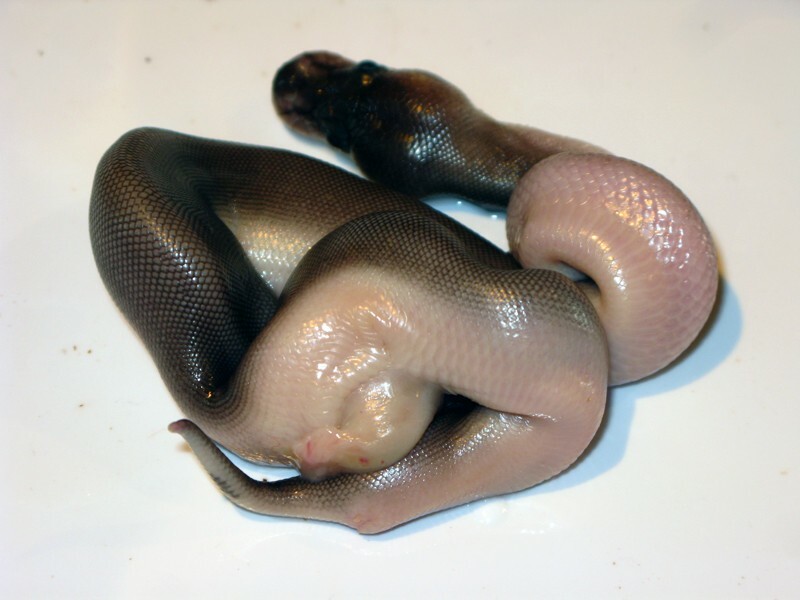 However, because of the widespread practice of captive inbreeding among herpetoculturists, many snakes have developed serious abnormalities that don’t only make them look odd (even gross) but also adversely affect their ability to survive. Other negative consequences of inbreeding include kinked spines, skeletal malformations, retarded growth, lack of organs upon hatching, and neurological problems. The one in this picture is the result of a pig subjected to linebreeding, The linebreeding is performed for a number of reasons, including the advantages of having good feet and legs, sows more functional teats, and breeding stocks with good temperament. Critics of inbreeding offer a rather poignant joke about pigs being subjected to inbreeding. They think that for breeders, it’s linebreeding when the results are good; inbreeding when the results are abnormal. Even ducks are not safe from the undesirable effects of inbreeding. 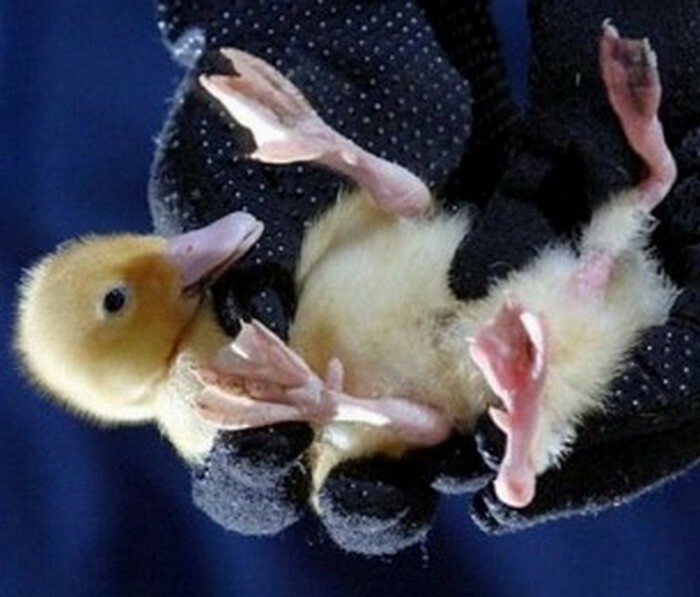 This picture shows a duckling that has suffered asymmetry conflicts after a breeder chose to breed ducks from a preferred line for the sake of more eggs or better egg laying performance. Ducklings with this kind of defect are unlikely to live long. 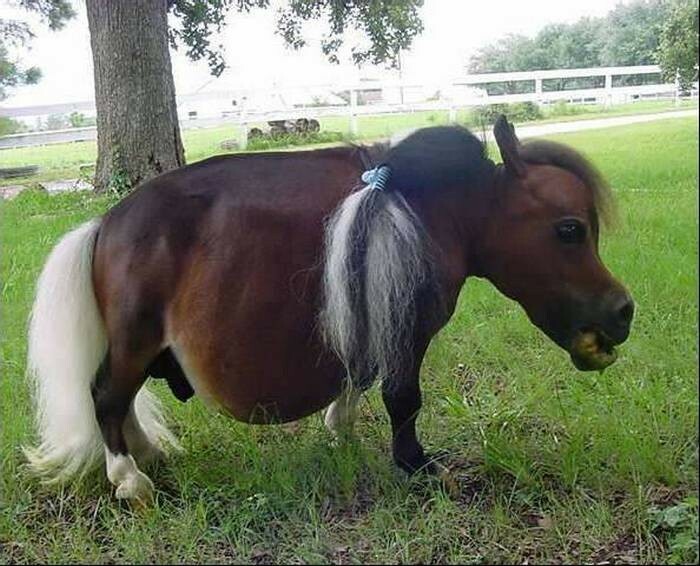 Miniature horses are supposed to look cute, unlike the one shown in this picture. It might be offensive to call this unfortunate creature creepy or ugly, but somebody has to call the point out. It’s not for humans to interfere with the natural breeding of horses to achieve desirable traits and produce animals that eventually get tagged as undesirable. A horse that does not look like a normal horse, is deprived of its normal life and should serve as a reminder for breeders to be more discerning in what they are doing. Sheep breeders need to be aware of the dangers of amplifying genetic disorders because of inbreeding. As scrupulous breeders say, inbreeding within the flock should be avoided even when it gets too tempting to do it because you have a healthy flock with enviably superior physical features. 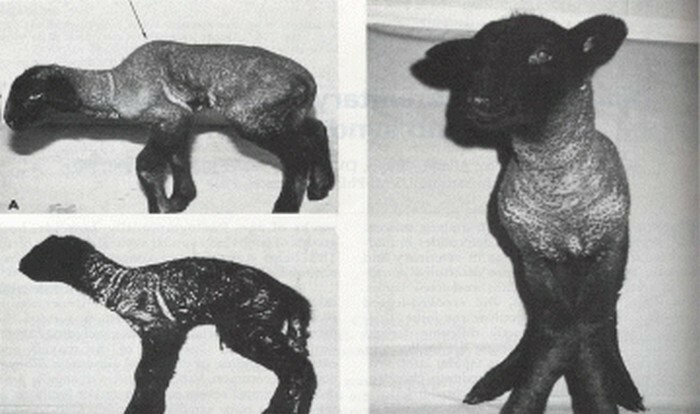 The picture here shows a sheep suffering from Spider Lamb Syndrome, a hereditary disorder that easily gets passed off to succeeding generations with inbreeding. Any idea what creature this is? Some say it looks like a shaven mouse. Some think of it as a weird anteater. There are also those who see an “unarmored” armadillo in it. 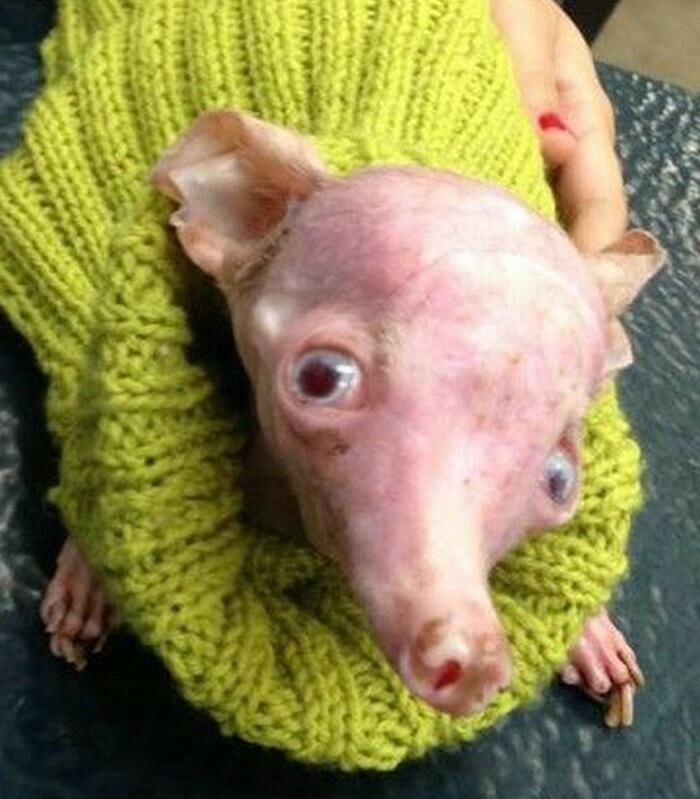 This creature is actually a dog, likely brought to its unfortunate state by inbreeding. Evolution, while contentious, is definitely different from inbreeding. If creatures were to develop or specialize traits or body parts, it has to be through evolution. It must be founded upon a need, something that follows a natural course that takes centuries or even millennia to be completed. Inbreeding is not something that can supplant evolution and should not be used to alter the natural constitution of animals to suit human wants or preferences.